Scorpion Velocity Jacket: It's More Fun With Velocity! High quality at a great value price. That is the mantra of Scorpion and for Spring 2016, Scorpion delivers once again. The Scorpion Velocity Jacket and it’s Hi-Viz brother, aptly named, the Scorpion Velocity Hi-Viz Jacket bring versatile 2-3 season comfort to a sub $300.00 package. 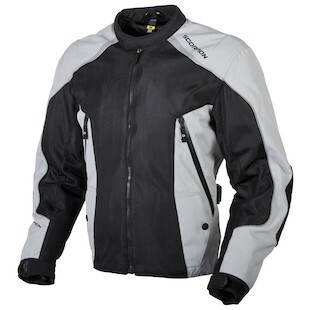 The Scorpion Velocity Jacket comes packed with features that would benefit a wide range of riding styles. Whether you’re commuting, touring, or going out for a weekend canyon carving adventure, the Velocity Jacket deserves consideration. 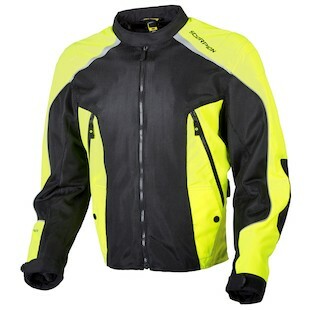 The body of the jacket is constructed of a durable 600 Denier fabric while the protection is beefed up to 840D at elbows. The highlight of the jacket is it’s versatility. This comes as a result of a removable waterproof liner that contains a fleece interior for added warmth. The liner itself has matching torso vents that match the layout of the outer shell, so when the temperature goes up, you won’t have to worry about having to pullover and pop your liner out, just unzip and keep moving. The Velocity comes out of the box sporting Sas-Tec CE rated armor at the elbows and shoulders and the SAS-TEC Back Protector would be a welcome addition as a replacement for the PE-Foam Pad. Scorpion delivers a high quality jacket for Spring 2016 to combat the heat and keep you protected on the hottest days, while allowing you to throw in a waterproof fleece for those wet and cool days in the saddle. The Velocity Jacket comes in 4 colorways ranging from murdered out for the more modest to the Scorpion Velocity Hi-Viz Jacket for the more safety conscious among us. I have always been a fan of Scorpion and have no doubt that the Velocity will be a nice addition to the Scorpion lineup. Get Stung.